I read, I review, I blog...A book review blog for the basic reader by a basic reader. All children's book illustrator Claire Turner ever wanted was to be a mother. After six years of trying to conceive, she and her husband, Josh, have finally accepted that she will never be pregnant with a child of their own. Yet once they give up hope, the couple gets the miracle they've been waiting for. For the first few months of her pregnancy, Claire and Josh are living on cloud nine. But when she begins to experience debilitating headaches, blurred vision, and even fainting spells, the soon-to-be mother goes to the doctor and receives a terrifying diagnosis. Since any treatment could put their unborn baby's life at risk, the Turners must carefully weigh their limited options. And as her symptoms worsen, Claire will have to make an impossible decision: Save her own life, or save her child's? USA Today and New York Times bestselling author Steena Holmes brings us an unforgettable story of one woman's courage and love. Claire Turner has almost everything anyone could want: a job she loves, a spouse she's head-over-heels in love with and who's in love with her, a beautiful home, loving and supportive friends, and a loving parent. The only thing she doesn't have is a child with her husband. The overwhelming desire for a child and the steps she'll take to ensure the safety of an unborn child are at the center of Saving Abby by Steena Holmes. Claire Turner presumed, as did her parents, that because she had an unremarkable pregnancy as a teenager, it would be easy for her to become pregnant later in life. Sadly, that hasn't been the case. Claire and Josh have been married for more than six years and even after in vitro attempts there's been no viable pregnancy. Since Claire and Josh work together on children's books -- Josh writes the story and Claire illustrates them -- they do a whirlwind tour of Europe to spark creative ideas for their stories. Upon their return home, Claire is struck by extreme fatigue and excruciatingly painful headaches. After being checked by her friend and doctor it is found that her fatigue is due to a pregnancy. A few months go by and the headaches are unrelenting and it is discovered that Claire has a brain tumor. Treatment isn't possible during her pregnancy, so she two choices: wait until she can deliver her baby, saving the baby's life and endangering her own, or pursue treatment saving her life and endangering her unborn child. 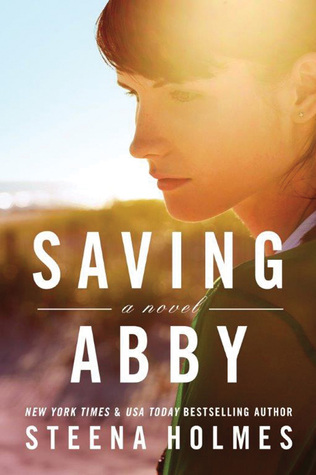 You might think that Saving Abby is a dark read because of the subject matter and you'd be wrong. Ms. Holmes has the uncanny ability to take dark themes and imbue them with light and hope. Her characters are realistic and relatable. The situations are easily taken from real life and don't seem fantastical or farfetched. Yes, there are some serious issues dealt with in Saving Abby - child mortality versus parent mortality, cancer mortality, and more, but all are presented in a respectful manner. If you're the type of person that enjoys reading HEAs (hopeful ever after), then you'll definitely want to read Saving Abby. This was another enjoyable Steena Holmes reading experience for me and I look forward to reading more from her in the future. Disclaimer: I purchased a digital copy of this book. I was not paid, required, or otherwise obligated to write a positive review. The opinions I have expressed are my own. I am disclosing this in accordance with the Federal Trade Commission's 16 CFR, Part 255: "Guides Concerning the Use of Endorsements and Testimonials in Advertising." Thank you for doing a book that Steena wrote as her books are just so good! A beautifully written, heartfelt book. Share book reviews and ratings with Vivian, and even join a book club on Goodreads. Vivian has read 56 books toward her goal of 365 books. Vivian has read 169 books toward her goal of 365 books. In accordance with new FTC guidelines for bloggers, this is to inform you that some posted reviews are provided after receipt of an Advanced Reading Copy (ARC) of a book (hardcover, paperback or ebook). These reviews are not considered endorsements, nor do I receive any compensation (other than the opportunity to read the book) for my review. These reviews are my opinions and thoughts only. If any posted review does not provide a "thank you" to a publisher or provider or otherwise denote it is an ARC-related review then the book is from my personal TBR stash. In addition, it should be noted that I am an Abebooks, Alibris, Amazon, Audiobooks, Barnes & Noble, Book Depository, Books-A-Million, Chronicle Books, Downpour Audiobooks, eBooks, Kobo, IndieBound, and ThriftBooks affiliate. What does this mean? Well, it means that if you make a purchase from any of these businesses after clicking through a link on this blog -- even if you don't buy a specifically linked title -- I will receive an incredibly small commission. Copyright 2011-2019 The Book Diva's Reads, All rights reserved. Theme images by luoman. Powered by Blogger.